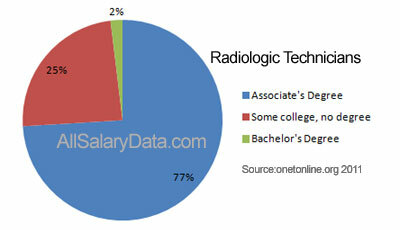 What is the average salary for Radiology Technician? Highest 10% earning over $74,790. Medical and diagnostic laboratories were the highest payers, offering a $55,210 median annual wage. Median annual wages in the federal executive branch, general surgical and medical hospitals, and outpatient care centres were each over $50,000. 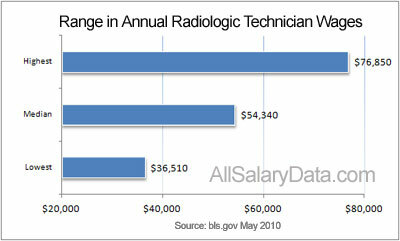 Radiology technician employment is expected to grow faster than average. As of 2018, the Bureau of Labor Statistics reported 214,700 people working in this field. From the years 2018 to 2028, the anticipated increase is 17 per cent, for a total of 37,000 additional workers. As medical technologies become more successful in treating disease, there will be an increasing need for diagnostic imaging to monitor treatment progress. Individuals who are skilled in multiple diagnostic imaging procedures will be most marketable. Hospitals, colleges, and universities provide multiple avenues of entry into a radiology technician career. A formal training program may result in a certificate or an associate or bachelor’s degree. 73% held an associate degree. 2% held a bachelor’s degree. Certificate programs usually have a duration of 21 to 24 months. In 2018, 213 certificate programs were accredited by the Joint Review Committee on Education in Radiologic Technology. The committee provided accreditation to an additional 25 bachelor degree and 397 associate degree programs that year. Both clinical and classroom instruction are included in the curriculum of each program. Anyone interested in pursuing this career should focus on math and science in high school. Licensure is required in most states and requirements vary by state. Being properly trained, as evidenced by a license, protects members of the public from hazards resulting from unnecessary exposure to radiation. A voluntary certification is offered by the American Registry of Radiologic Technologists. Graduation from an ARRT-accredited educational program and a passing score on an examination are required to receive certification. Every two years, certified individuals must complete 24 hours of continuing education. Radiology technicians operate complex equipment that aids in patient diagnosis and treatment. Diagnostic medical sonographers, also called ultrasound technicians, direct sound waves into various areas of the body. Nuclear medicine technologists use cameras that identify and map radiopharmaceuticals in the body to create diagnostic images. The heart and blood vessels are the focus of cardiovascular technologists, who assist physicians in the diagnosis and treatment of relevant ailments. American Registry of Radiologic Technologists.